We've been talking a lot of Belo products lately. Belo is unstoppable in making skincare products for our every needs. Introducing their newest line: Belo Baby. This is dedicated specifically for the charming angels in the family but still can be used by the entire family. If it can be for babies then, it can be for everybody. If you are a mommy, this one is totally for you. I am still not a mom but this Belo line got me excited. The dotted blue packaging is like a heaven sent already. Let's take a look of the products. This one is not just for baby but definitely for the entire family. As you all know, the hair and body wash is enough for our little angel's daily bath. This one is a good addition for those young at hearts to try products that are 100% natural and no harmful chemicals. The texture and consistency is just like our usual soap. You can feel that it is very mild and not drying at all. And the ingredients single ladies and moms..
Belo Baby Face and Body Lotion. I told you it is not just beneficial for babies but for us adults too. This mild and gentle lotion is ligthweight and non-greasy. The smell is also mild which is perfect for babies. This is great for sensitive skin. If you want to keep it mild and moisturized, well you got it with this lotion. As labeled, it is rich in shea butter, cocoa butter and sweet almond oil. It sounds really moisturizing. 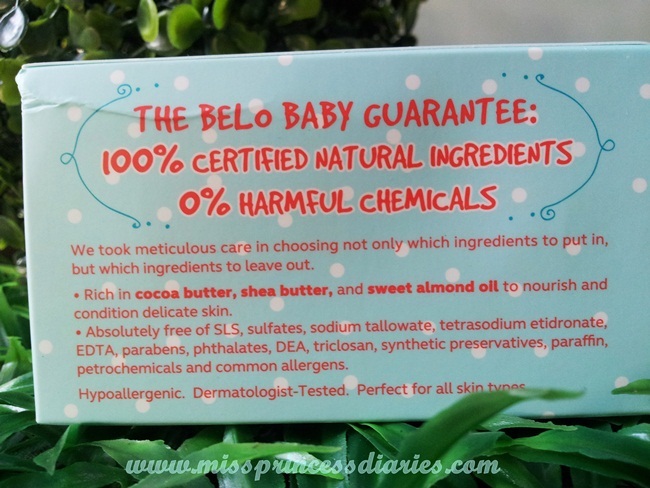 Belo Baby Hair and Body Wash. This baby wash is actually enough for the babies. This one, I might say, is the one crafted only for baby. A hair and body wash all in one is what they need. The scent is mild. It is very gentle on skin and leaves the skin soft and smooth. It is packaged in an easy to use pump bottle which is good. It doesn't bubble which I approve for babies because it means no added chemicals and is safe to use for babies. It is absolutely free of SLS, sulfates, paraben, etc.. Overall, good thing we have another local brand to use for our babies. The ingredients were well-picked to use for the most delicate skin. It is hypoallergenic and can be use for all skin types. It has no harmful chemicals and has 100% certified natural ingredients. It is affordably great for babies. It is very gentle and mild on skin. The scent is neutral which is good for babies.